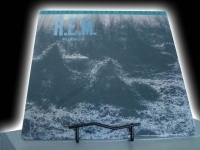 "R.E.M., Murmur - MFSL Low #d 726 - Anadisq 200 Gram"
MFSL Anadisq 200 Gram 1/2 Speed LP "Out of Print, Last Copies" MFSL SEALED - R.E.M. "Murmur" - Anadisq 200. This MFSL Anadisq 200 heavy vinyl Half Speed re-issue is a piece of musical history and is the only audiophile pressing of this classic recording. LOW NUMBERED 726 OF THE 7500 PRESSED. ALL LONG OUT OF PRINT. You will be one of the last to own this MFSL Limited Edition sonic gem especially in this "low numbered pressing". What a tremendous "GIFT" this Vinyl Masterpiece would make any true R.E.M. fan. R.E.M. 's 1983 debut album turned the rock world on its ear. This is music which has withstood the test of time and has influenced countless bands. Reviewers gave Murmur a "10" out of 10 -- their highest rating. Tracks Include: "Radio Free Europe" "Pilgrimage" "Laughing" "Talk About the Passion" "Moral Kiosk" "Perfect Circle" "Catapult" "Sitting Still" "9-9" "Shaking Through" "We Walk" "West of the Fields" "There She Goes Again" "9-9 [Live]" "Gardening at Night [Live]" "Catapult [Live]".